Join Christian Professionals (Rainmakers) as they welcome Josh McDowell on Friday, February 15, 8 am – 9:30 am, Indiana Wesleyan University North Campus, 3777 Priority Way S Dr, Indianapolis, IN 46240. You are invited! Guests are welcome. Register today. Too often we fall into the trap that our identity is shaped by how we look, how we perform and what we achieve. We live a life of performance and expectations. In this life-changing message, Josh gets to the heart of how God sees us—lovable, valuable and competent. And He demonstrated that by taking extraordinary steps so He could enjoy a relationship with us. You’ll learn that your self-image should be based on how God views you…no more and no less. 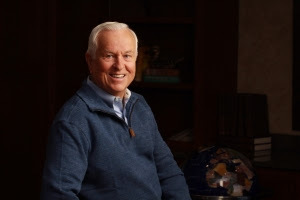 A trailblazer for truth and relationships, Josh McDowell has been at the forefront of cultural trends and ground-breaking ministry for over five decades. Since 1960, Josh has delivered more than 27,000 talks to over 25,000,000 people in 125 countries. He has written or co-author of 148 books, including More Than a Carpenter and New Evidence That Demands a Verdict, recognized by World Magazine as one of the top 40 books of the twentieth century. Josh’s books have been translated into 128 different languages. Josh McDowell Ministry is Cru Ministry.